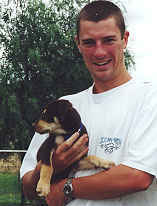 Noonbarra Jim was sold to David Applegate who wanted a dog to work around horses. He is very pleased with Jim and has phoned up a few times as well as written. "Jim is going great guns, settling in as expected. He is a really great companion learning all about horses and what not to do when someone is riding ( ha ha ). I am booked in to a working dog training day, just to have a look down at Jim Luce from Bungonia so (Noonbarra) Jim and I are venturing down for the day to watch and learn. We have started some bark busters with my friend and he is going fantastic. Everyone comments on how smart he is( mentally and physically). I took Jim to the last draft I competed in, just for an outing , they also happened to have cattle dog working trail on that day. I knew I had something special in Jim when all the old bushies kept asking me who he was by and did I have any more like him. I must have given , a dozen people your number, so hope you don't mind. They all just thought what I know, he is a special little pup. " "... Ubu's obedience is good. I think he is well behaved for his age and I'm very happy with him...You would be pleased to know he has gone up 4 classes at his obedience school and has gone through an agility course a few times and seemed to enjoy it. We could have advanced a couple of classes, but we sometimes miss a few weeks of classes here and there but we still practice at home. Noonbarra Ram went to a lovely young family at Carcoar back in 1990. Andrew and Kylie were both Police officers and lived in the historic township of Carcoar where many years earlier Charles King, one of famous people associated with the foundation of the Kelpie, had lived. Kylie and Andrew put a lot of time into training Ram and taught him to be a terrific trick dog that was well known in the district. He was often the a hit at the local hotel on a Friday night where he performed a number of tricks for the locals. 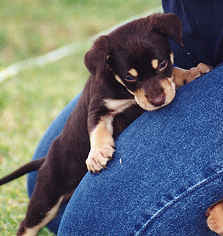 You were right Stephen, after a few day Kelli settled in and became the little puppy we expected. You guys were right, he has been testing us to our limits. He tries to get away with absolutely everything. We stick to our guns though! " "Kelli and I are doing great. We started obedience on the weekend. It was cold and raining but I was glad to finally be there. So was Kelli!" - Anthony Cutajar Melbourne. Victoria.
" I am writing this letter to thank you for allowing me to become part of the Noonbarra family. I know how much you value customer feedback so I have no problem in rabbiting on about how great Kelli is turning out to be. Big Kell is an extremely happy and friendly dog. Everyone that meets him tells me how adorable and good looking he is. He wants to play with everyone. The first couple of weeks were very hard for me. Thank you very much for the support and patience you had in helping me out with numerous questions I came up with. 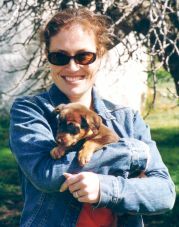 .. Kell is turning out to be a wonderful housedog and good friend." Thank you for keeping in contact and sending out that information. Just a quick word to let you know how Kelli is... He is an extremely happy dog. We have started agility which he is a natural at, as would be expected. Other owners are having so much trouble with certain tasks where as Kelli, once he stops trying to play with other dogs, needs little encouragement.
" Jessie is really great. We are starting to train her now as she is becoming more receptive. She loves other dogs so much - which is great - it means that she is already well socialised. She is such a good natured dog. She loves people as well and she seems to be able to entertain herself very well while we are away at work. We take her everywhere we go and she just loves being involved." " Well, I thought I'd drop you a line to let you know that Jessie is just fantastic. We love her so much and can't imagine what life was like before her! "We took her to Centennial Park yesterday and she met a few dogs and just loved it. She was watching the joggers and cyclists intently - she's a very curious little thing. She then went to my sisters place which was loaded with little kids who didn't want to leave her alone." 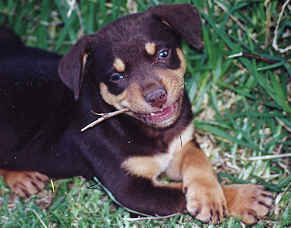 Red & Tan Male Born: 27th Jan. 2000. 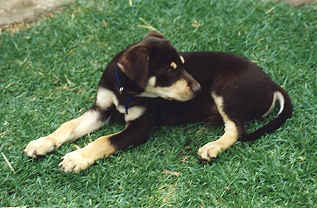 Kip was sold as a companion Kelpie to young Brad up near Port Macquarie. 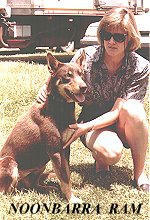 He was a lovely pup and a brother to Noonbarra Libby, Noonbarra Jillaroo etc. 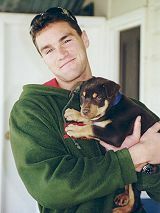 Brad often contacted us to let us know of Kip's progress. 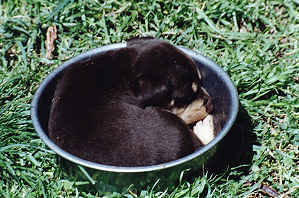 Noonbarra Kip asleep in his food dish. Maybe he didn't want to miss the next meal !! !